Death Of A Salesman DVD (2000) Region 1. Color. Brian Dennehy, Elizabeth Franz, Ron Eldard, Ted Koch. Brian Dennehy gives a Tony Award-winning performance in Arthur Miller's classic Pulitzer Prize-winning Broadway play. 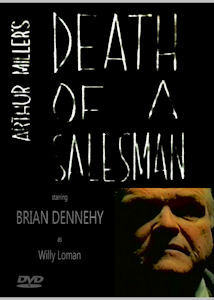 Willy Loman (Dennehy) is an aging salesman is fired from his job after a long career. Broken, without much to look forward to, he tries reconnecting with his wife and kids who he had always put down as he dedicated himself to work. Loman confuses past events with his current reality as his family witnesses his harrowing downward spiral. Not to be missed.